We are now celebrating our 30th Annual Frances Walton Competition. The Application window for the 2019 Competition closed on March 15, 2019. Finals will be held June 1, 2019 in Seattle at Magnolia Lutheran Church. Click for the 2018 winners. 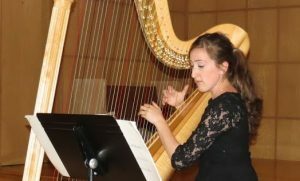 Classical music tours in eastern and western Washington communities and schools featuring the winners of the 2018 Frances Walton Competition were scheduled in September 2018. Solo winners of the 2018 Frances Walton Competition Artem Kuznetsov and Soren Hamm performed in the towns of Everson, Sekiu and Raymond as part of the west leg of statewide tour. Solo winners Steven Jay Lerman and Yibing Zhang performed in Omak, Chelan and Yakima as part of the east leg of statewide tour. The Zēlos Saxophone Quartet performed during the Puget Sound Tour of the Frances Walton Competition. 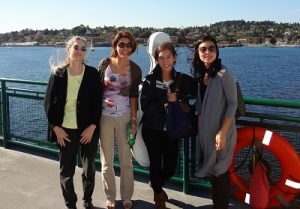 Watch highlights from the Puget Sound Tour with the Zēlos Quartet below. Held annually in the spring, the Frances Walton Competition is a solo and ensemble competition for classical soloists ages 20-35 and small ensembles of two, three or four members with an averaged age of 20-35 who live or study in one of the following 19 western states: Alaska, Arizona, California, Colorado, Hawaii, Idaho, Kansas, Nebraska, Montana, Nevada, New Mexico, North Dakota, Oklahoma, Oregon, South Dakota, Texas, Utah, Washington, and Wyoming. Competitors submit audio auditions in the Spring. Audition finalists participate in the day-long competition which will be held in Seattle in June each year. Four solo winners and one ensemble winner are selected. The winners receive cash prizes and present a free public concert in the evening on the day of the competition. Each September, the winners participate in three statewide tours: Eastern Washington, Western Washington and the Puget Sound region. Accompanied by LMC members, these talented artists present free public recitals and visit schools in outlying areas that have limited access to classical music. The winners perform in classrooms or at assemblies and answer students’ questions about music, the instruments and their training background. Application deadline (including audio recordings) for the 2019 Competition was March 15th and is now closed. All applications are submitted online at https://app.getacceptd.com/lmcseattle. Rules for each category will appear on each category’s page: small ensemble, marimba, piano, strings, voice, winds. If you have any questions, please email the competition committee: awards@lmcseattle.org.